When I was in Montreal I kept hearing about the wonderful lemon squares that Grandma Kathy Jarvis would make. I finally said to Catherine one day, I am going to try to match those, for whatever I make, it always seems to be measured against the lemon squares which come in at a 10/10. "Fine," said Catherine, "I will even give you her recipe." So I tried the squares. Mine came in at an 11/10 for the kids, though I told them that would be impossible since it was the same recipe as she used. 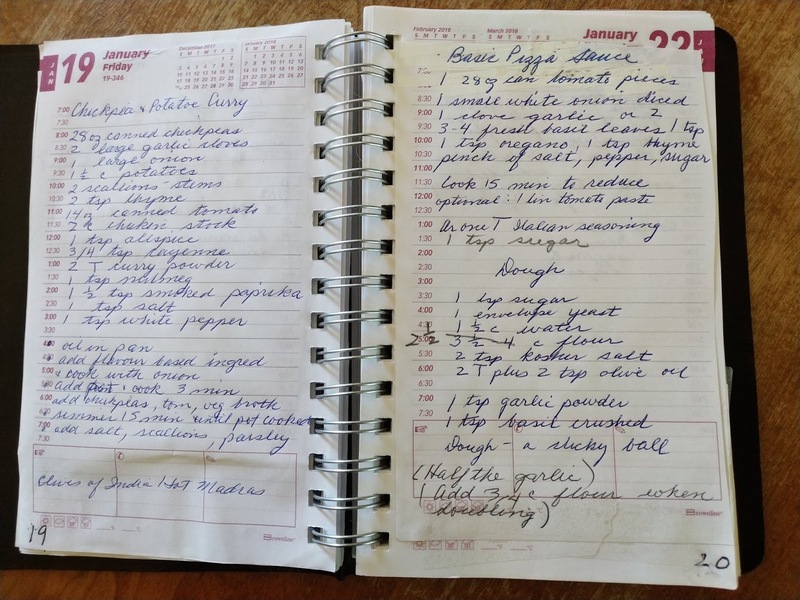 However, I did write the recipe down on an empty page of my day timer in case I needed to make it again when I wasn’t in Montreal. Fast forward to being at the lake in April and Doral was making guacamole, the best I have ever tasted. “How do you do this,” I asked. “Oh, mine is always so good for it is made with love,” he answered. I don't believe in cooking with love. Still I took down the recipe and put it in the early part of my day timer, since now I was into June and it didn’t really matter what went onto the January pages. 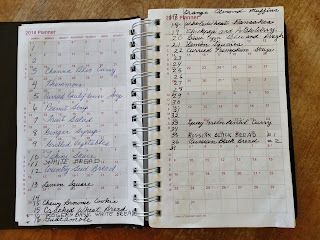 And so the days went on, me making a recipe or two and then putting it in the day timer in case I wanted to do it again. My day timer is my only constant anymore in my travels. That and my fitbit. 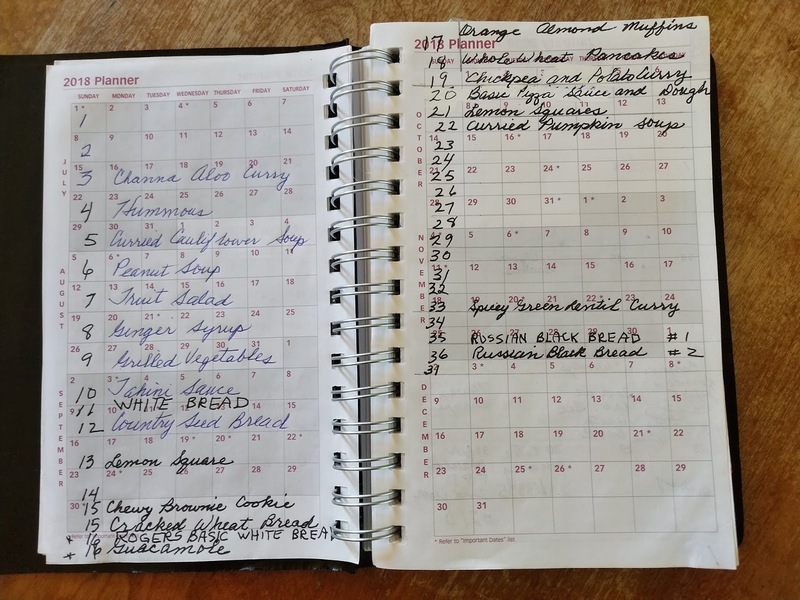 I have collected so many recipe that today I had to make an Index in the foremost pages of my day timer, so that I can easily find the recipes, which accumulate as I move from house to house. At Rebecca’s I have been doing all kinds of breads: Russian Black Bread, Country Seed Bread, Cracked Wheat Bread. And some of her law students wanted to know how to make bread, so they came to the house and we did a Basic White Bread and then turned it into cinnamon buns. 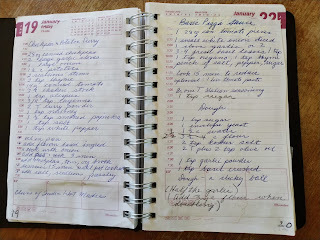 I found myself cutting the recipe off of the back of the Roger’s 10 kilogram bag of flour and pasting it in my book, along with their almond orange muffins – not because I want to make the latter, but I might as well have it on one of the empty January pages of my book. If I come your way to stay for a couple of weeks (or months) I will be ready to make lemon squares. I do go to the Larchkitchens.blogspot.ca for many recipes. Thank you Laynie Hicks for setting that up.